Tweetie bird helmets are recommended. The dogs are trained to understand certain commands. 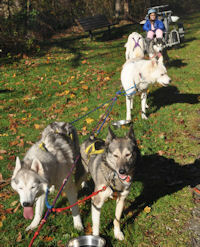 This command is used to get the dogs to turn around on the trail and line out the opposite direction. Come Haw means to come to left as you turn around. This is the command used to tell the dogs to turn right. This command is used to tell the dogs to move to the right side of the trail. This command is frequently used in passing another dog team or other trail traffic. This is the command used to tell the dogs to turn left. These are the terms most frequently used to get the dogs started. 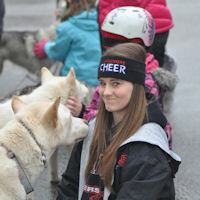 Contrary to popular belief, "mush" is not a command used in dog sledding. This is the command which tells the dogs (especially the leaders) to hold the line out tight. This is particularly important when setting up the team to avoid tangles. This is the command used to tell the dogs to go on by a distraction or a trail. 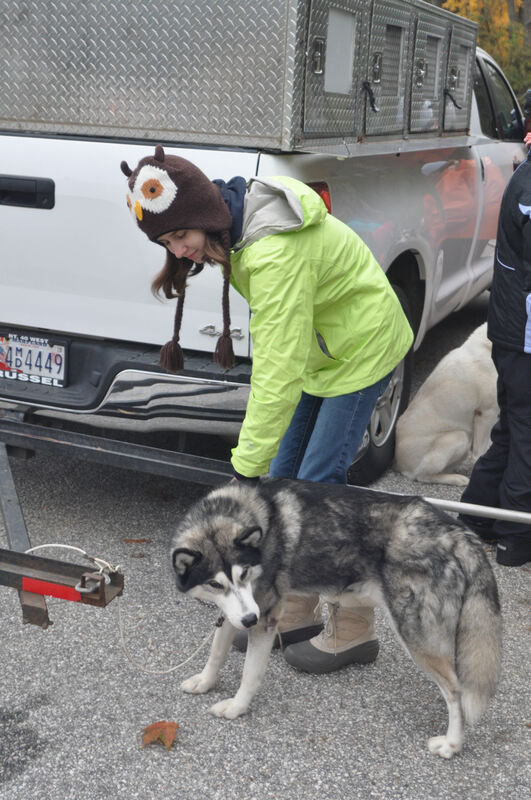 Common distractions include wildlife, a loose or leashed dogs, piles of horse manure, another dog team, a horse, joggers, bicyclists, etc. In a perfect world, this command is used to slow the dogs down and stop them. In an imperfect world, that is what the brakes are for. 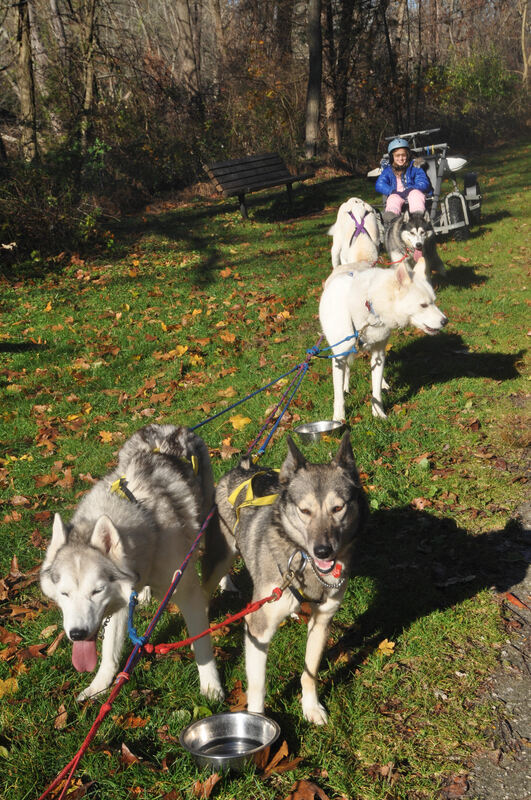 Boy Scout and Girl Scout Dog Sledding Programs! 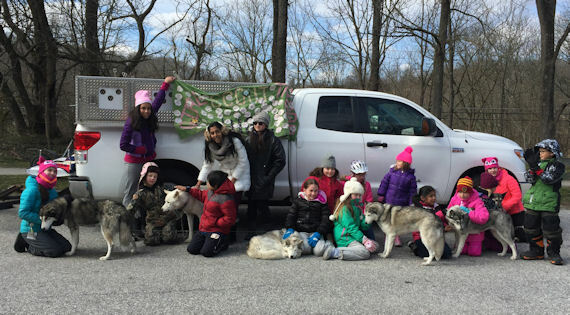 Maryland Sled Dog Adventures LLC offers educational programs on dog sledding, dryland dog sledding, mushing, and other dog powered sports for Girl Scouts and Boy Scouts. 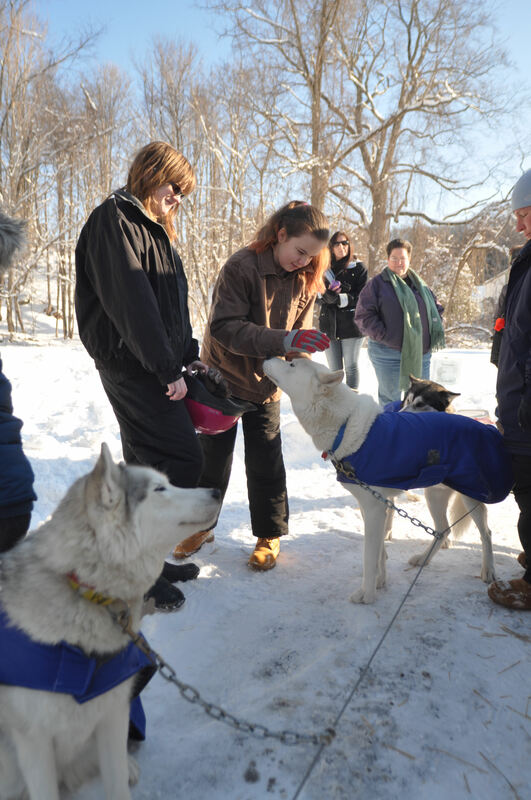 As part of the program, Boy Scouts and Girl Scouts get the opportunity to earn a dog sledding patch. 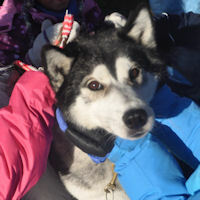 For more information on our Boy Scout and Girl Scout patch program, see our dog sledding tours page. 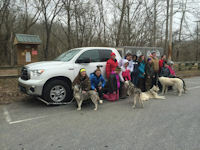 The six excited Siberian Huskies pull the Girl Scout and the musher on the dryland dog sledding rig. 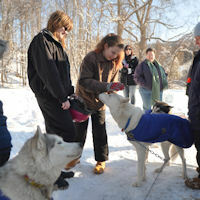 The meet and greet with the sled dogs including Beaver is a big part of the program. 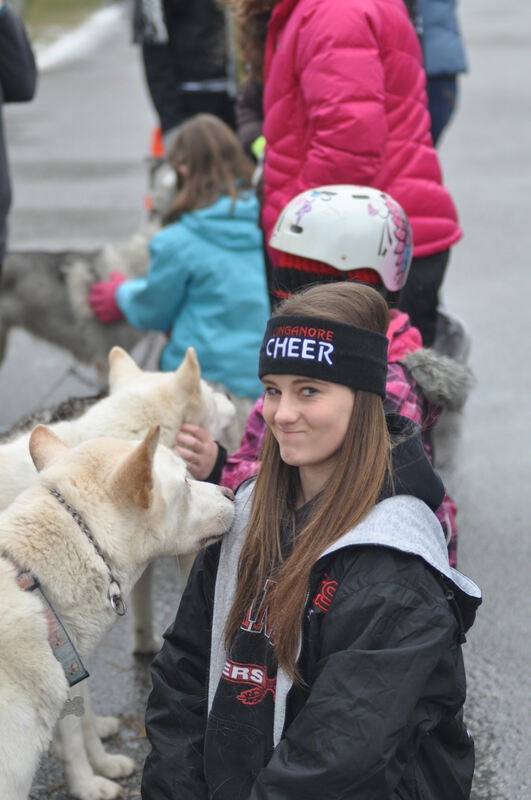 Okemo looks interested in this Girl Scout. 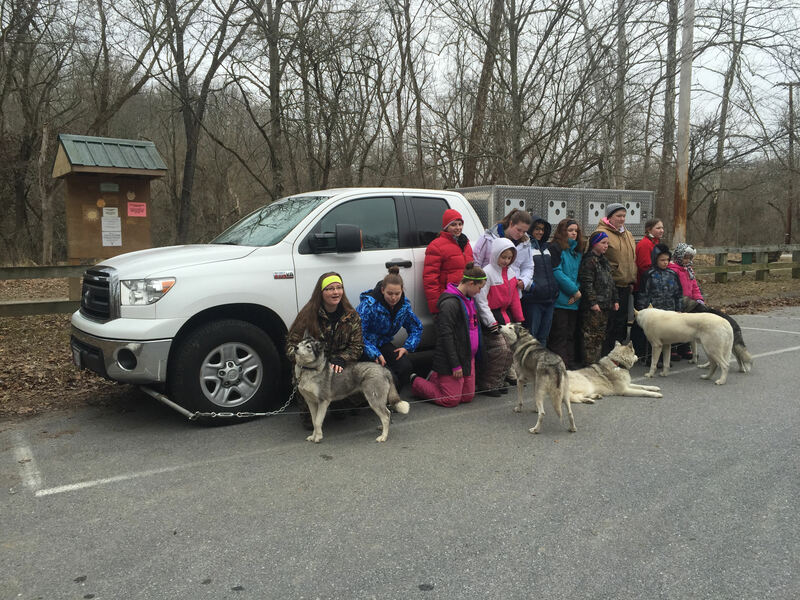 It was a cold and snowy morning when these Girl Scouts came out to work with the sled dogs. 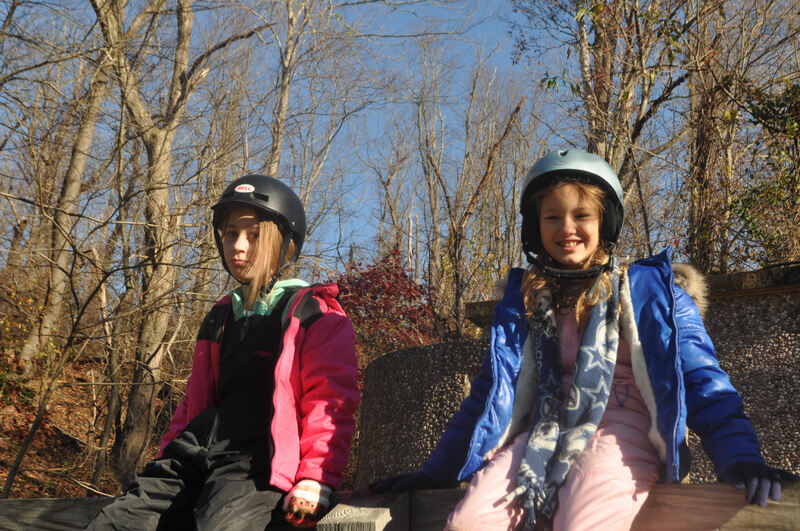 These two Girl Scouts look happy as they wait to try their hand at dryland dog sledding. 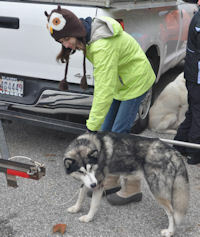 Small hands help with Beaver's x-back dog sledding harness. 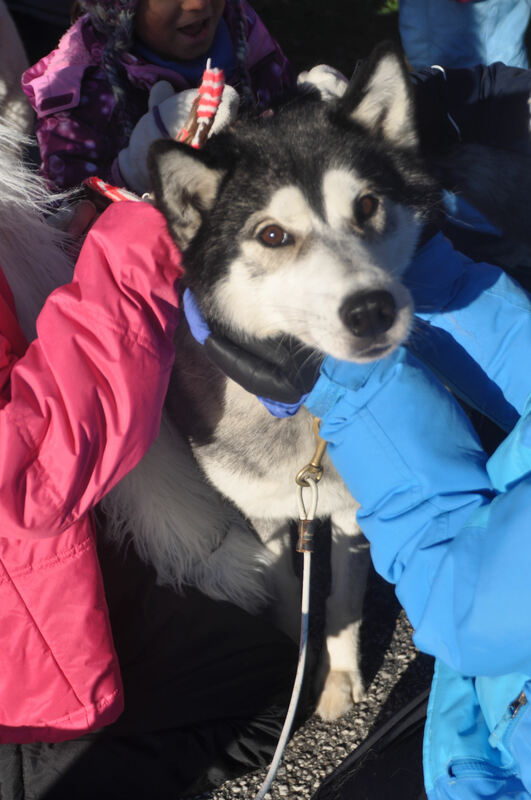 Sled dogs Acadia and Ebony during a pause in the action during one of our Girl Scout Patch Programs.